Many Sabre sunglasses have sturdy acetate frames, which are not only stylish but also durable enough for active wearers. For example, the Heartbreaker Sunglasses have hand-tooled acetate frames available in varying black, glossy and tortoise colors. Wire injected temples insure strength, and the glasses have durable Viscottica 5 Barrel Hinges. They protect against 100 percent of the sun’s UV rays with CR39 gradient lenses that allow outstanding clarity. They also have a base lens curvature of 600. Sabre’s Detox sunglasses have slightly thicker acetate frames for even more durability and a different style. At the same time, the frames are lightweight enough to ensure comfort. These glasses come with CR-39 gradient lenses to offer the most shade up top where you need it most. They block 100 percent of the sun’s UV rays. Like all Sabre glasses, the Detox has top-quality components such as wire injected temples and smooth Viscottica 5 Barrel Hinges. 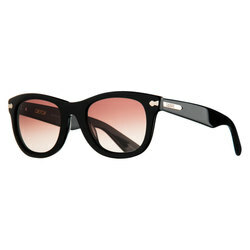 The Village Sunglasses by Sabre have a classic shape that will remain timelessly stylish year after year. Available in glossy or regular acetate frame options, these glasses outshine the competition in more ways than one. They have a comfortable base curvature of 600 and block 100 percent of the sun’s UV rays. Like other Sabre models, the Village has lenses that make your eyes comfortable in bright light without being overly dark in moderate lighting. Sabre’s No Control Sunglasses also have a classic look with a subtly less rounded shape than the Village. They feature the same great acetate hand-tooled construction, along with wire-injected temples, a base curvature of 600 and top-quality Viscottica 5 Barrel Hinges. Bright sunlight is not only uncomfortable; it is also unhealthy for the eyes. Sabre glasses block harsh UV rays without darkening your vision to the point of a less clear outlook. They are built for style. Whether you prefer a skater-influenced street style or a simple and classic design, there is a Sabre pair to compliment any look. Sabre takes notes from popular and vintage culture, but it sets its own trends rather than following the pack. Each pair of glasses is designed for durability, so they will withstand adventures, minor scrapes and crazy weather.